I never owned this toy but a friend of mine had one of this, and I was indeed very jealous. 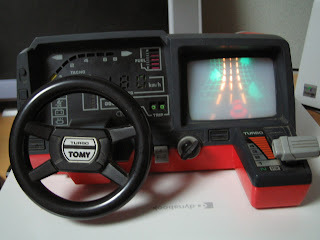 The Turbo Racing Cockpit manufactured by Tomy allowed players to steer a racing car that can be seen on the monitor. It featured a steering wheel, ignition key and an accelerator stick. You never really crash or die, it's just rev it up and go. Toys don't get cooler than that. Having done some research into this toy, it was actually made in the 80s, but it makes an appearance on this blog due to its life through to the 90s. Shine on Tomy. I had one of these and my sister broke it within the first month. Whoa, I remember those!! I really wanted one! I remember this! Great post. My first thought was a cringe. Oh man, that is such an 80's toy. It's good we grew out of that style. I had one of these! I thought the steering wheel was on the other side, though. I remember those! My brother had one!! Jesus, I think I actually remember this. Though all I remember is that it always looked like you were driving upwards in a loop. I'll be honest witcha, Tomy was one of the best toy companies back in the day. WHOA. I think I had one of these! I have only the most vague memories of it though, and it was unbelievably awesome back then. The privacy of our visitors to aboutthenineties.blogspot.com is important to us. At aboutthenineties.blogspot.com, we recognize that privacy of your personal information is important. Here is information on what types of personal information we receive and collect when you use and visit http://aboutthenineties.blogspot.com, and how we safeguard your information. We never sell your personal information to third parties. We also use third party advertisements on http://aboutthenineties.blogspot.com to support our site. Some of these advertisers may use technology such as cookies and web beacons when they advertise on our site, which will also send these advertisers (such as Google through the Google AdSense program) information including your IP address, your ISP , the browser you used to visit our site, and in some cases, whether you have Flash installed. This is generally used for geotargeting purposes (showing New York real estate ads to someone in New York, for example) or showing certain ads based on specific sites visited (such as showing cooking ads to someone who frequents cooking sites).